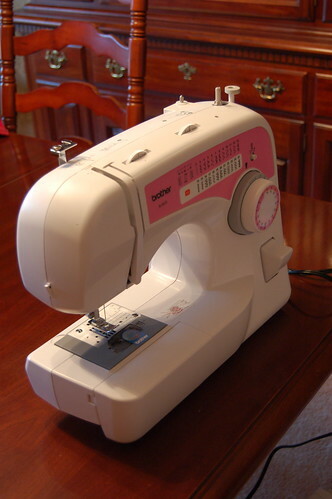 As much as I love crafts, I’ve just never gotten into using a sewing machine. I just treated myself to this one, and I’m still a little bit afraid of it. Yes, I know it’s pink. It’s still a little scary. The instructions for loading up a bobbin and threading the machine were easy enough, so I worked on a little test swatch and decided to just jump into a project. 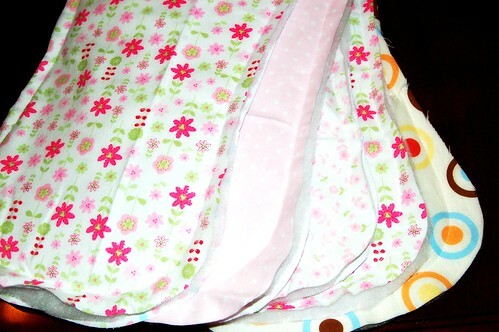 I found a tutorial for making rag edge burp cloths at Homemade by Jill. This is a PERFECT first sewing project. Buying a set of flannel receiving blankets to use as fabric is an easy way to get a range of colors and designs that were made to go together. The pattern doesn’t require pre-washing or ironing of the fabric, so you can get right to the interesting parts. It doesn’t matter if the seam is perfect as the finished edge will be ragged to hide small mistakes, which is quite comforting to a newbie. 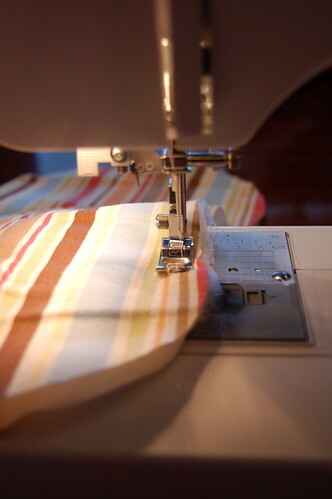 Really, it would be difficult to find an easier first sewing project. It didn’t take long to have the stitching done. Maybe I don’t need to be afraid of this thing after all.